That changed this year with the introduction of a new theme, “The Promise of Play” which explored how play fuels human creativity and is as basic a biological drive as sleeping and eating. Kevin Carroll, founder of Kevin Carroll Katalyst/LLC and an author, speaker and agent for social change (a.k.a. the Katalyst). Ellen Galinsky, President and Co-Founder of Families and Work Institute (FWI) and author of over 40 books and reports on work and family life. Kathy Hirsh-Pasek, the Stanley and Deborah Lefkowitz Professor of Psychology at Temple University in Philadelphia and author of 11 books and over 150 professional articles on early childhood and infant development. 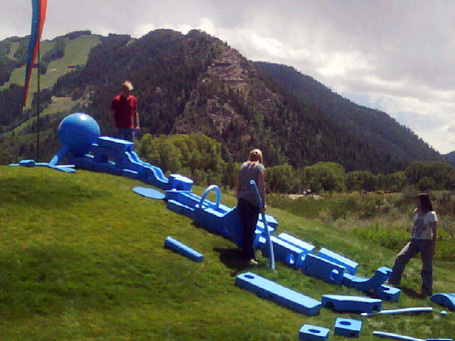 David Rockwell, an American architect and designer who conceived and designed manipulable play systems called Imagination Playground™. Brendan Tuohey, who co-founded PeacePlayers International (formerly Playing for Peace) in 2001, a global organization that uses sport to unite and educate young people in divided communities. For more videos, visit the Aspen Ideas Festival AudioVideo Library. For photos, see the Photo Gallery.